Animal tales are short stories where animals think and act like people, impersonating their behavior in a humorous and thought-provoking way. 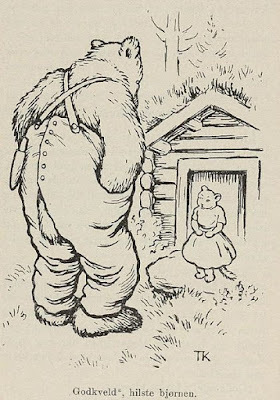 The strong and good-natured bear are deceived by the lure and enterprising fox; the pig yearns for a better life, but learns to know its place, and so forth. 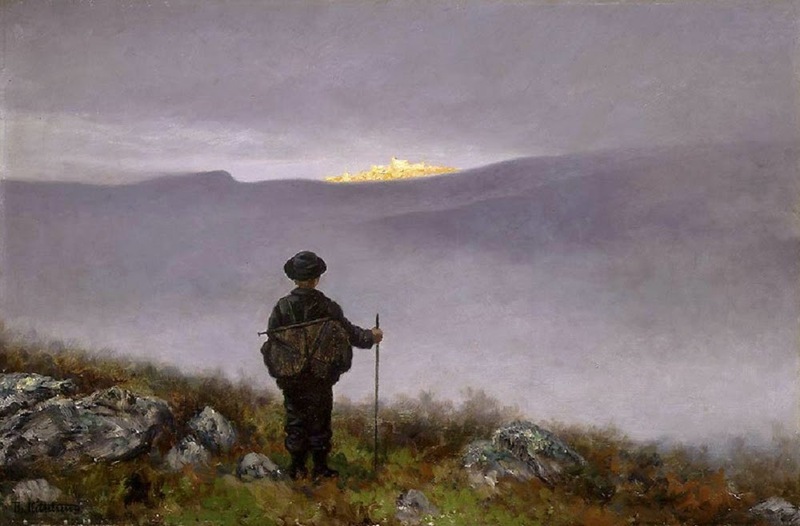 One of the most well-known and beloved Norwegian fairytales within this tradition, is Reveenka (Eng. ”The Fox’s Widow”), about a fair widowed fox living deep in the woods with her maid, a feline named Korse. Not long after her husband's passing, suitors begins to knock on her door. I, as surely many others, remember this tale as an all time favorite. After reading it anew however, it dawned on me that the moral of the story is not as evident as I once thought it was. Seemingly, the widow appears as a quite shallow and high-maintenance character, only interested in her suitor’s appearance, for then in the end to favor the one bearing most resemblance to her late husband. Then again, seeing that there are so many different varieties of this tale, the subject matter must have been of great importance for people in the old rural communities. As the social mobility was kept considerably in check, many men would therefore gladly pursue a widow who owned a house and farm. This way, if one were not in position, nor owned property, the possibility to obtain such could be brought about through marriage. That is, if one luckily succeeded in wooing the woman in question. Once upon a time, there was a fox and his missis, who lived deep in the woods in their house. They were friends, and lived easily together, as couples do at times. Then came the day, when the fox had been in the henhouse, where he the whole lot. 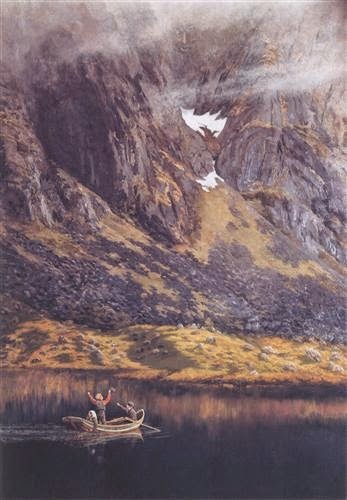 It turned out the fox had bitten off more than he could chew, for shortly thereafter he became ill and died; and no matter how much his misses mourned and wept, it did no use. He was dead, and dead he remained. As soon as the funeral was over, and the fox was six feet under, suitors starting knocking on the widow’s door. At one Saturday night, three knocks resounded in the little cottage. "Go out, Korse, and see what’s going on," the fox’s widow said; she had a tabby cat as a servant girl, and her name was Korse. When the girl came out, a bear was waiting on the porch. “Good evening," greeted the bear. "Good evening to you too," said Korse. "Is fox’s widow at home tonight?" he asked. "She's inside," replied the girl. "How is she doing tonight, is she doing well or badly?" asked bear. "She mourns her husband's death, and cries her nose sore and red - she does not know her wits' end poor thing," said the tabby. "Ask her to come out for a walk, then she will receive some good advice!" said the bear. "Who is it that comes knocking on my door, disrupting our evening’s peace?" "It's one of your suitors," said the cat; "wanting me to ask you to come out for a walk - you will receive some good advice, he said." "How did he look?" asked the widow. "Let him go, let him go! I do not need his advice." "She asks you to go home, she will not have your advice." And so, there was nothing left for the bear to do, than to turn around, and go back to where he came from. The following Saturday night, someone came knocked on the door again. This time, a wolf stood waiting on the front porch. "Good evening," said the wolf, "is the fox’s widow at home?" “How is she doing tonight, is she doing well or badly?" he wanted to know. "Ask her to come out for a walk, then she will receive some good advice!" said the wolf. "Who is it that comes knocking on my door, disrupting our evening’s peace?" asked the missis. No, before anything else the widow wanted to know how he looked. "Quite beautiful, gray, lean and tall," said Korse. And on that note, there was nothing left for the wolf to do, than to turn around, and go back to where he came from. On the third Saturday night, the same thing happened. Three knocks on the front door, and the cat went out to check. Now, it was a hare standing outside. "Good evening to you too," she replied; "are there strangers out and about, so late at night?" Indeed, she was right about that, and then he asked, as the others, whether the fox’s widow was home and how she was doing. "Ask her to come out for a walk, then she will receive some good advice!" said the hare. "Who is it that comes knocking on my door, disrupting our evening’s peace?" the mistress exclaimed. "It's one of your suitors," replied the girl. Then she wanted to know how he looked like. "Quite beautiful, white, heavy coat, well groomed," replied the tabby. No use did it do though: "Let him go, let him go! I do not need his advice," said the fox’s widow. On the fourth Saturday night, three knocks resounded on the door once more. "Go out, Korse, and see what’s going on," the widow said to the girl. When the tabby opened the door, a fox stood waiting on the front porch. "Good evening, and good to see you again," he said. "Good evening to you too," she replied. “Is the missis at home?” he asked. "She is, yet mourns her husband's death, and cries her nose sore and red - she does not know her wits' end poor thing," said the tabby. "Ask her to come out for a walk, she will receive some good advice!" replied the fox. And so, Korse went back inside. "Who is it that comes knocking on my door, disrupting our evening’s peace?" the widow wanted to know. "It's another one of your suitors," said the cat; "wanting me to ask you to come out for a walk - you will receive some good advice, he said." "Handsome, beautiful red, - just as your late husband," the tabby replied. ”Oh dear, let him in, he might have some good advice!” said the widow. For this suitor, she did not mind settle for, and so a wedding feast was held right away. And if this fox has yet to visit the henhouse, then they still reside in the little cottage, even to this day. In 1962 the fairytale was adapted into a short film by Norwegian director Ivo Caprino, renowned for his puppet films. With its sparkling animation, directing, charming characters and music by Bjarne Amdahl, the little flick quickly gained national stardom. A fair amount of changes was made to the story; here, each of the suitors encounters an old woman who has got her nose stuck in a tree stump. For over a hundred years she has been standing there, asking passersby for help. Caprino also integrated an additional narrative, an odd little tale by the name of “The hare who had been married”. Caprino thus transformed the hare from being one of the widow’s wooers, to a happy-go-lucky character, skipping about in the forest. While the wolf and the bear could care less about the hag, the fox takes the time to help her out (which naturally pays off). He is also the only one who does not has the slightest interest in eating the poor hare. In the end of course, neither the self-centered wolf, nor the hostile bear get what they want. The handsome, young fox, however, does. Emerging almost like an Ashlad-like character, kind, smiling and helpful, he manages to charm his way to love and good fortune. Once upon a time, there was a hare, who was out walking in the forest. "Oh, hurray, skip and jump!" he exclaimed happily, doing flips and somersaults on his way. 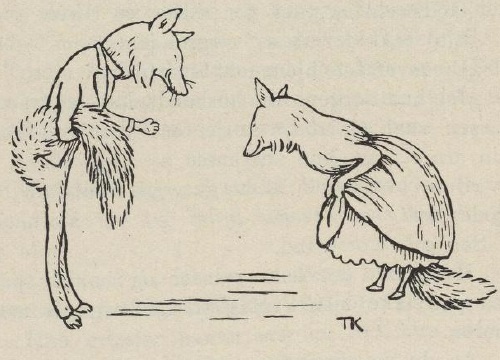 Then a fox came slinking along. ”Well, isn’t that nice,” said the fox. ”Oh, it wasn’t that nice, for she was age-old and quite the hag,” replied the hare. ”Well, that’s a pity?” said the fox. "Oh, it wasn’t such a pity," said the hare, "for she was wealthy, she had a house." "Well, that was good to hear,” replied to fox. "Oh, it wasn’t that good,” said the hare, "for the house burned to the ground, together with everything we owned." "How sad!” replied the fox. "Oh, it wasn’t that sad," said the hare, "for the hag burned up as well."